How you will be able to identify both qualitative and quantitative data depends on the recipe, but it's possible with almost any experiment. The qualitative data is easy to collect, a simple way is a basic taste test, inquiring about the texture, flavor, color, etc. depending on the food. Quantitative data can be a little more complicated, but finding changes in mass, pH, etc. are all options. For example, if you’re trying to identify what amount of baking soda will give you the fluffiest cookie, you could create three different recipes, each with a different amount of baking soda. You can then conduct a taste test asking people to choose the fluffiest cookie. This taste test could also include questions like “Which was the grainiest?” and “Which was the toughest?” This will provide the qualitative data that you need. For quantitative data you could find the change in mass before and after each of the three cookies were cooked. ​ Once this data is all collected, you can see which change in mass relates to the favorite cookie recipe. I would assume that the smallest change in mass would lead to the fluffiest cookie, but depending on the qualitative data that could be wrong. 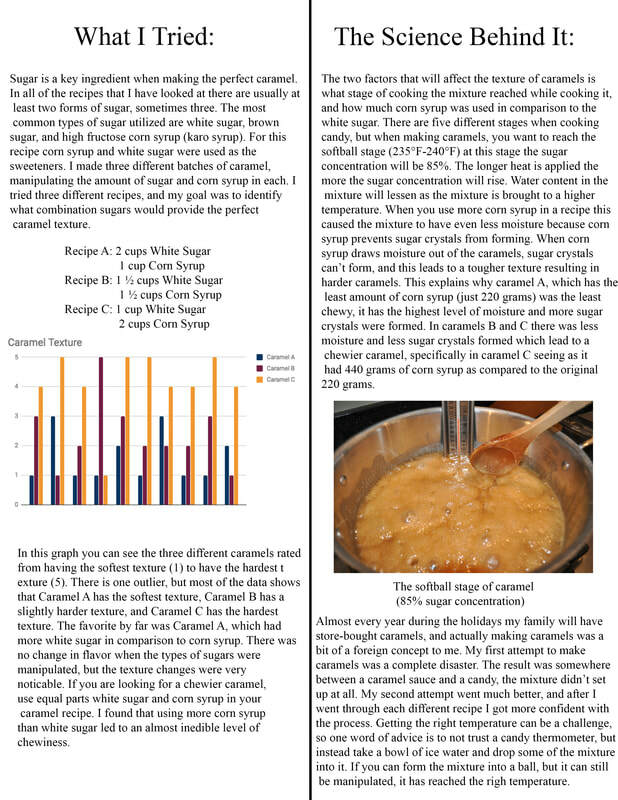 By having both quantitative and qualitative data, you will be able to determine which recipe was the most successful. 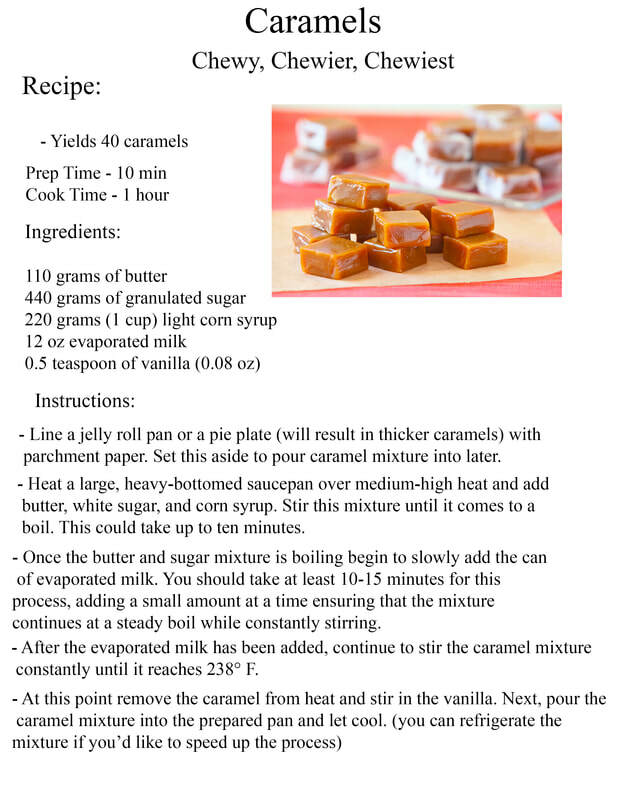 You can then add information to the final recipe instructing people on how to make the cookies fluffier or more dense based on their preference. Cooking and conducting science are similar in many ways. The most obvious similarity is that generally when cooking you follow a recipe, or at least when you first start learning you do, that’s the same when doing a lab in chemistry. You follow a list of instructions, and use a list of supplies, similar to an ingredients list. There is always an expected outcome when following a recipe, this is comparable to the expected outcome or results of a lab. The main differences I see between cooking food, and doing chemistry are the technical aspects. Although you measure out quantities when following recipes, these recipes generally don’t have to be exact (if you’re not baking) in order to end up with the expected outcome. When conducting a lab or experiment, measurements need to be perfectly exact or you could end up with the opposite of your goal. Overall, science and cooking have a similar basis of following instructions, but chemistry is generally a more technical process than preparing food. Cooks and food scientists are focused on very different aspects of food. The goal of a cook is to identify how to prepare food in a way that will be most pleasing to the people eating it. A food scientist is looking at food on the molecular level, not necessarily paying attention to the taste. Food scientists may also look at the calories and nutritional aspects of a specific food while a cook is looking at flavor combinations. This does lead to a similarity between the two, which is the fact that flavor combinations can connect to chemistry. This can be through understanding why we like sweet and salty flavors, and what caused those flavors to occur in various foods. During this project the content I focused on was how water was filtered so that it was safe to drink. This included not only the steps of filtration, but learning about where the City of Durango gets there water from. We get our water from the Florida River, and from there it goes to the water treatment facility. For our project we focused on the four basic steps of water filtration. 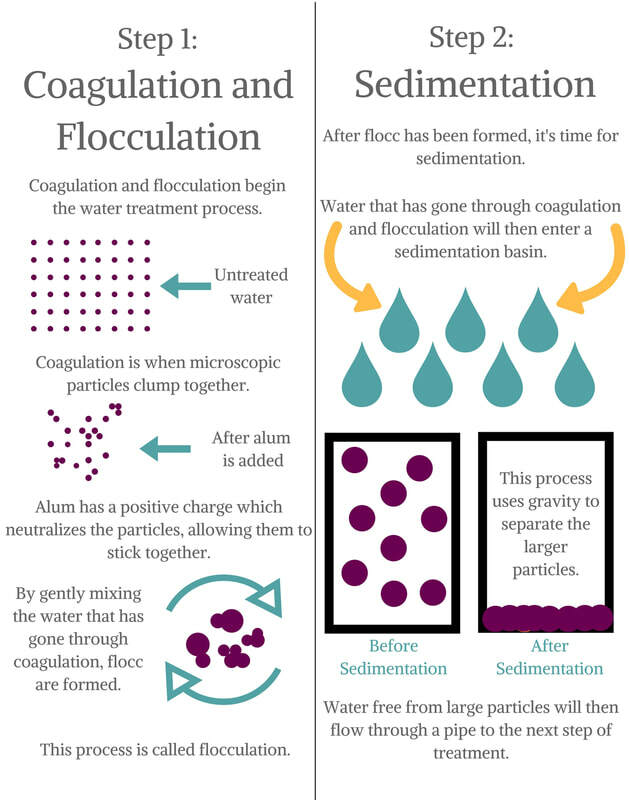 The first one being coagulation and flocculation. Coagulation is when microscopic particles bond together through the addition of a chemical with a positive charge. Once this chemical is added the particles of a negative charge will be neutralized and have the ability to bond together. By mixing this solution flocculation will occur, which is when smaller particles bond together to create larger particles. The second step is sedimentation, where the newly formed particles will sink to the bottom due to weight, and the water free from large particles will move on to the next step. The third step is filtration. For exhibition we focused on the sand and gravel filter, which is most commonly used in water treatment facilities. 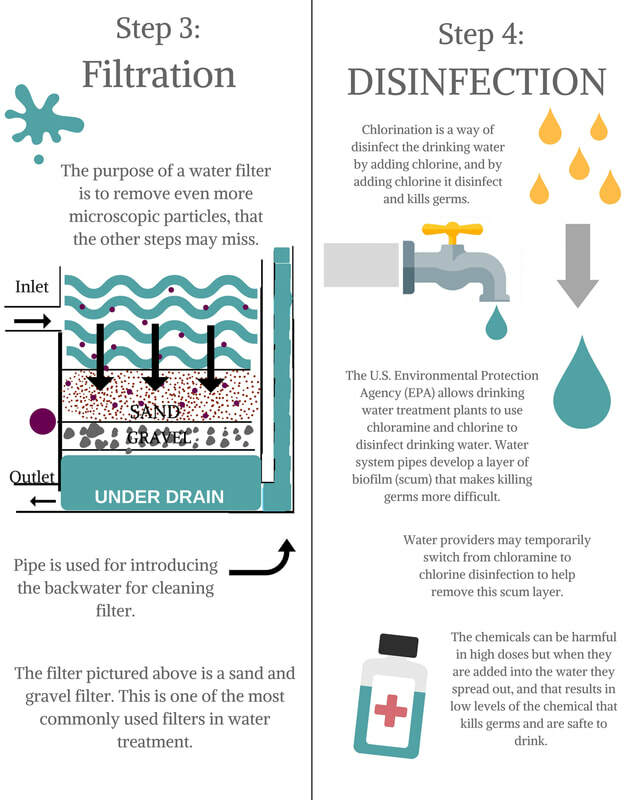 During this step the water will be placed through the filter multiple times, having a goal to remove any remaining particles that may still be in the water. The fourth step is disinfection. In the state of Colorado, we add a very small amount of chlorine to our drinking water in order to remove any possibly harmful viruses or bacteria. During this project the main skill that I believe I improved on was taking complicated information, and making it understandable for a general audience. I have used infographics in the past, but have always struggled with using to much text, and having a lack of pictures. Infographics are a perfect way to express information without boring the audience, especially for visual learners. I created the first two infographics and at first really struggled with how to fit all the information without using a large amount of text. I went though a few different drafts that I wasn't happy with, but then found a way to represent various steps of water filtration through pictures, which were much easier to understand than words. As a group we spent a lot of time focusing on how we were going to make the process of water filtration approachable, and I think that that caused me to have an even better understanding of the content. By brainstorming ways to make the steps of water filtration understandable, I had to have a very comprehensive understanding of what each of those steps entailed before I could teach other people about it. ​I believe that water quality is an incredibly important topic for people of all ages to understand, seeing as it affects all of us everyday. I personally didn't feel like I learned a huge amount of specifically chemistry content during this project, but am glad we studied it because it impacts our everyday lives. The information I learning from presentations from Mountain Studies Institute and the various other guest speakers was completely new to me, but had a big affect on how I view the wastewater treatment plant. Previous to this project I didn't know why the new wastewater treatment plant was being built, but now that I have all the background information I can for educating opinions on the issues surrounding it. Water quality in general is a very important subject to learn, and I think that seeing as it connects to the real world and our everyday lives, students will be more attentive to the information. Each person in America uses an average of close to 100 gallons of water each day, and most of us take it for granted. This water doesn’t come straight from a river or reservoir, it goes through an extensive water treatment process that includes coagulation, flocculation, sedimentation, and other steps. Here you can see that we have different filtration steps for you to filter water, as well as posters explaining each filtration step. We want the audience to learn not only about the process of filtering drinking water, but also about how to make an at home water filter. Possibly even get them curious enough to make one at home themselves. We want the audience to feel how important water filtration is, and what could happen if the water treatment plant doesn’t get all chemicals or pollutants out. The story our exhibit will demonstrate is the filtration process for water quality in Durango, which include coagulation, flocculation, sedimentation, disinfection and filtration. Issues that we would like to be able to address is how our water in the city of Durango is treated to become drinking water. Our audience will be impacted by our exhibit because it closely affects the citizens of Durango because everyone has drinking water and would be affected greatly if something were to happen to the water supply. Our reasoning for creating this project was to see the step by step process of what goes on when drinking water is filtered. Our work connects with the other classmates because we are all talking about water treatment and water quality, and our project would be building to that knowledge. We think our audience targets most ages, because it will be inclusive for children to be apart of, and have the capability for hands on learning, but the watching and learning about what goes on will be more for older ages. The educational subject of our project will probably be more for mature ages, because they will have more background on the topics we are discussing. Our audience would be interested in water filtration, because they will gain more knowledge of how it works, and an idea of what is occurring in the water treatment facility. The idea for our project is to last around 5 minutes. One minute for each steep and about 2 minutes for the information. For our actual presentation of the project, it won’t be all hands on, just because it will take more time for sedimentation to take place, but they will still be able to get an idea of what happens, and be able to pour some of the water themselves. The fact that we are encouraging the audience to get an idea of what goes on, and see how it happens will be enticing. We will also have infographics that takes them step by step through each process, that shows and tells what is going on. The primary senses that will be engaged will be the sense of touch, sense of sight and possibly sense of smell (depending if beginning water is foul). Sense of touch because they will be taking part in the project and pouring the water and filtering it out. Sense of sight because they will be watching what happens, and possibly sense of smell if any of our products smell. The role the audience will be playing is viewing, for the process, and getting an experience/perspective of what is happening. Our project deserves to be included in the City of Durango’s final plans for the remodeled Santa Rita Wastewater Reclamation Facility because water purification has a big role in the treatment of water, and it would be good knowledge to have on how it is filtered.